The Georgia Court of Appeals has overturned a conviction for a traffic offense based on the fact that the officer only listed the title of the offense and the code section. See Strickland v. The State, A18A1829 (2019). In the case in question, the citation was written for the offense of “Following too closely” with the code section being 40-6-49 O.C.G.A. In other words, the citation needs to list the facts necessary to establish the elements of the offense. A simple listing of the details of the offense written in the remarks section should be sufficient. Posted in Uncategorized on January 30, 2019 by J. Lee Weems. “When James Bogan Weems went to work on March 9, 1968, there was no reason to anticipate that before the day was out he would be a corpse, made so by an armed robber…”. So begins this tale of woe. Bogan was my father’s first cousin. He was a World War II veteran having served in an anti-tank company of the 155th Infantry. On his last night working as the manager of the Red Bird Service Station in Clarksdale, MS, he was shot and killed by one Tommy McNeal. Obviously, if he was killed that night, it was his last night working there or anywhere else, but our tale is compounded in its woefulness in that Bogan had accepted another job, and that fateful night was his final scheduled shift. As I so oft heard the story, Bogan had regularly made bold pronouncements as to what he would do if anyone ever tried to rob his station. True to his word, Bogan put up a fight with his .32 Smith & Wesson, but 3:1 are bad odds when you are flying solo. Tommy McNeal was not alone. There was no profit for their misdeeds as our antagonists dropped the money in the midsts of their gunfire hastened departure. Bogan’s demise was one of those precautionary tales of my youth; as much a part of my upbringing as another that I have related. My grandmother told me that Bogan’s killer had gotten off on a technicality, but she never offered details. One day I was inspired to consult the all-knowing Google, and right there just waiting for me to come looking were the court decisions in the case. Tommy McNeal fled to Chicago, but he was captured. At the initial trial, one of the prosecution witnesses did not testify as expected, at least as expected by the prosecutor, who then asked for and was granted a mistrial on the grounds that he wanted a do-over. A second trial resulted in a conviction and sentence of life imprisonment for McNeal. He appealed claiming error in the jury instructions, but the state of Mississippi was wont to turn loose a killer. After his state-level appeals were exhausted, McNeal’s lawyers filed a federal habeas corpus petition. It was denied at the district court, but the federal appellate judges undertook a more strict reading of the Constitution than did their Mississippi and federal district counterparts, and they found fault with the prosecution’s tactics; thus a killer was set free. The dissenting judge pointed out that a claim of double jeopardy was not raised at the second criminal trial as it should have been; however, the rest of the appellate court didn’t seem to think that poor lawyering was cause to overlook the Constitution. For brevity’s sake, I didn’t outline all of the prosecutorial shenanigans in this case. They are detailed in the federal appeal. While I see the validity in the dissenting opinion, I can’t escape the fact that the prosecution botched the case, and the rules are that the burden is on the prosecution, vouchsafed protections and such, even when it is my kin being made a corpse by an armed robber. Posted in Uncategorized on January 11, 2019 by J. Lee Weems. “No trespassing” signs in Georgia are meaningless. 16-7-21 O.C.G.A. is the statute that deals with criminal trespass. The first part of the criminal trespass law deals with intentional damage to someone else’s property with the damage being less than $500, and it also addresses the malicious inference with the possession or use of another’s property. That part is pretty simple. The misunderstanding of the law pertains to entry onto the property of another. In other words, if they own it or rightfully occupy it, they can prohibit entry or order others to leave it. Also, if a parent or guardian has given such notice, this can’t be undone by a minor child. As to item number two in the above instances, signs are not specific and individualized notice. There are a multitude of cases in which the Georgia appellate courts have held that individuals must be specifically advised of exactly which property they are prohibited from entering or remaining. There is even a case in which a conviction was overturned because the defendant had been ordered to stay away from her ex-husband’s place of employment via a divorce decree rather than an actual owner/occupant/representative of the property. In order to prosecute a person for criminal trespass, the state must prove that the person received a specific and individual notice to leave or not enter a specific property. There is case law that such notice is valid for two years. From a practical standpoint, as a peace officer, I don’t know who you have authorized to swim in your pool or fish in your pond or otherwise be on your property. Furthermore, I can’t decide who you can let swim in your pool or fish in your pond, etc. You are the property owner, and that is your decision. Methods of notification may include sending someone a registered letter informing them to stay off of a specific property or serving an individual personally with written notice to stay off of a specific property. It’s a typical (but may not be universal) practice for law enforcement to carry either a “barring notice” or “prohibited entry form” that can be filled out on scene and served to individuals, but again note, this must be at the behest of the owner/occupant/representative or the property. A verbal notice will also work, but my advice would be to make a recording of such notice being given. Posted in Uncategorized on September 2, 2018 by J. Lee Weems. 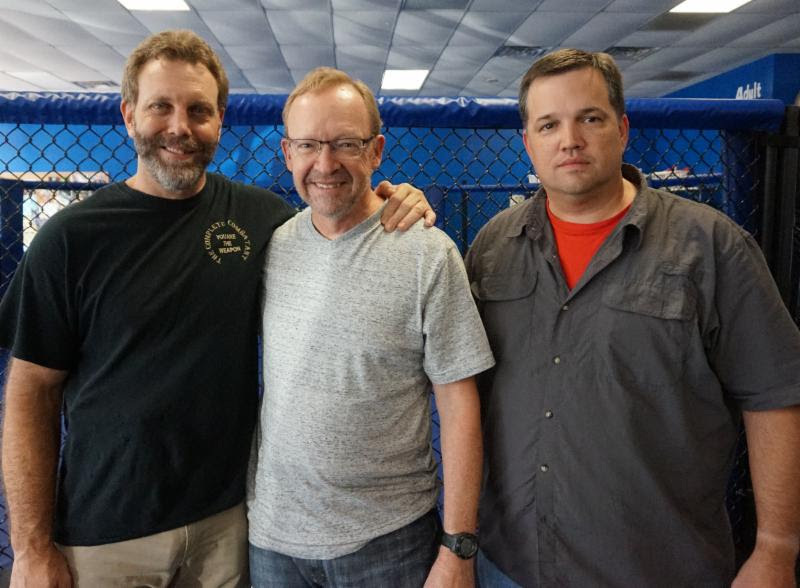 Another example of the classes that they are bringing in to augment their own offerings, they hosted Andrew Branca’s Law of Self Defense course. Andrew’s material is a “must” for the armed citizen. He provides valuable information that is grounded in actual statutory and case law without getting wrapped around bogeyman and interweb fantasy stories. Also of note, Brian has completed the Law of Self Defense instructor course. I have attended Andrew’s presentation at the Tactical Conference, and this was a good opportunity to get the full two-day presentation. I have purchased his book, and hope to do a stand alone review of his material at some point, but again, it is a “must”. This weekend, the timing finally worked out for me to take their 1.5 day The Complete Combatant course. This class is taught at their facility in Marietta. The first day begins at 4:00 PM and runs for four hours. The second day begins at 9:00 AM and runs until 5:00 PM. It’s a full day of training as there is a presentation during lunch. For this class, the presentation was me talking about Police-Citizen Contacts. I have presented on this dozens of times, but this was the first time I had to do so after getting smacked in the head. The course material was intense, but the teaching style was relaxed. I very much appreciated this approach. While the material did involve striking and ground fighting, it wasn’t a gladiator camp with a bunch of MMA folks having fun with fresh meat, and the coaches weren’t screaming or telling students, “If you can’t execute a perfect rear naked spinning death punch your are going to die.” It was solid, simple techniques that one didn’t have to have a martial arts background to learn and actually utilize. The lessons built upon one another culminating in a final scenario. There were numerous alumni in this class session (customers who came back, that’s a clue), and their scenarios took this into account. I liked this approach as it put an added value on students who wanted a refresher in the course work but who wanted to face greater challenges. The more we master physical techniques, the more our brain’s processing power can be devoted to the problem. Likewise, students weren’t thrown to the wolves. Finally, noted instructor, Claude Werner, audited the course at Brian and Shelley’s request. This indicates two things. First, they are confident in their material as they aren’t afraid of asking someone who isn’t bashful about his opinions to look at their coursework. It also shows that they are seeking a learned opinion to offer suggested improvements. They have other course offerings that would work well for those who can’t devote an entire weekend to such a class. Give them a look. The Federal Law Enforcement Training Center (FLETC) has a program that allows state, local, tribal, and territorial officers to attend classes at FLETC along with federal agents/officers, and I was afforded the opportunity to attend the Use of Force Instructor Program. Other state/local agencies represented in the class were the Alaska State Troopers, the New Orleans Police Department, and the Gwinnett County (GA) Sheriff’s Office. Federal agencies represented in the class included Immigration and Customs Enforcement, National Park Service, Diplomatic Security Service, Federal Protective Service, Federal Air Marshals, Treasury Department, Customs and Border Protection, Defense Intelligence Agency, Homeland Security, and the United States Coast Guard. Numerous FLETC staff instructors also attended as students. The course was two-weeks in length and included numerous testing points along the way. At the end of the first week, students had to pass a written test covering the academic blocks presented in the first week. During week two, we had graded practical exercises, an individual oral review board with a panel consisting of an instructor and a lawyer, and each student made a 30-minute presentation on an assigned topic. A failure at any testing point resulted in dismissal from the program. Not everyone made it to graduation. A note on the testing: this was not a “gimme class”. It was not taken for granted that a basic instructor training had prepared students to develop and deliver presentations. This had to be demonstrated in the class. The practical exercises were no joke. The oral review boards were the real test. While the written test measured recognition, the oral board required recall and the ability to explain the material. Some of the questions were simply knowledge checks, but there were others in which applying and explaining the course material was required. Students had to truly know, understand, and be able to explain the material. The academic training included blocks on legal aspects of use of force, liability, human performance factors (Force Science Institute stuff), and procedures for training with non-lethal training ammunition (NLTA) and developing training programs. The first week also consisted of numerous laboratories in which students were exposed to drills and scenarios. During the second week, we ran drills and scenarios that were developed by the class. The training methodology involved the initial use of drills. The student would be given specific instructions for a response such as the use of a baton or a firearm, etc. Sometimes the drill would include a transition from one implement to another. Each drill would be followed by a debrief in which the student articulated the actions of the role player as well as their own actions. After the drills came scenarios in which students were given a pre-brief such as a type of call and other pertinent information and sent into the training area to handle it. Sometimes the role players would comply; sometimes they wouldn’t. The student was expected to respond in an objectively reasonable manner. As previously stated, each drill/scenario would be followed with a detailed debrief. The purpose of the dictated response drills, particularly those involving transitions, were to “build the files” for responses to avoid the euphemistic “404 file not found”. The courts describe such incidents as tense, uncertain, and rapidly evolving. The facts of an incident often change during an incident, and when the facts change; the response changes. For instance, in one scenario, I was sent to arrest a person on a warrant for not paying child support. I found the suspect at his job site. It so happens he was a groundskeeper, and he didn’t want to go to jail; a point of view he emphasized with his shovel, but he reconsidered his opinion once I drew my pistol; however, at that point he decided to resort to fisticuffs. I countered his argument with a baton. Of course, a debrief followed. The scenarios didn’t require a specific response. The response had to be objectively reasonable based upon the interpretations and procedures of the Supreme Court. The responses to such incidents are not cookie cutter responses. Where one officer my utilize a baton while another officer might utilize pepper spray in the same instance, what matters is that the response is objectively reasonable based upon the facts of the situation. Our graded practical exam involved functioning as the instructor to include giving the pre-brief, observing the scenario, and then conducting the debrief. The “student” for the scenario was a FLETC staff instructor. This was followed by going through a scenario as a student to test our application of the material to the facts presented and our ability to articulate our actions. Ample of use of the Student Centered Feedback Model was the method of debrief. This method, if used properly, is a very effective tool in both drawing out the details of the incident and breaking free from “cop speak”. For instance, there is a difference between “he took up a fighting stance” and actually describing a fighting stance so that it is clear exactly what the person did. To any agency heads that read this, I strongly recommend that you get people from your training units through this class and allow them to come back and implement what they learned. Also, don’t get a case of sticker shock when look at the costs. The published costs are a worst case scenario for if no on-center housing is available and the student has to stay at a contracted hotel, and there may be other ways to offset the costs fully or partially. Even at the full published amounts the training is worth it if you allow your personnel to implement the material across your entire organization. Don’t look at it as an expense; look at it as an investment, and I would put this class alongside the Force Science Institute program as far as the quality and usefulness of information, which reminds me, you need to get your training staff through that course as well. Posted in Training & Shooting on January 16, 2016 by J. Lee Weems. I grew up primarily on what had been my grandfather’s dairy. My father harped on me when dealing with the livestock, “Familiarity breeds contempt”. The meaning of that saying was just as soon as you started thinking one of the livestock wouldn’t hurt you, it would hurt you. It was more than just words. My grandfather was killed by one of his cows. Today, I dealt with a guy whom we had arrested previously. He has an active protective order against him. In that encounter, he tried to bait me into an escalation. Later in the day, I responded to a call with the same subject. He entered a residence from which he is prohibited, and he busted out the windshield of a car on scene as well along with some other damage. The subject fled to a nearby vacant house. It was there that I confronted him. He screamed at me to shoot him. And then he shoved his hand into his jacket pocket. I had a decision to make and only a split second in which to make it. I was pretty sure that he was just baiting me. I was pretty sure that he didn’t have a firearm in his pocket, but in a moment of tachypsychia I heard my father’s voice.. I had to make a split-second decision as to whether or not to press the trigger. Legally, I can articulate a justification for doing so, but if I had, I’d be the latest cop to be plastered all over the news as having killed an unarmed man. If he had been armed, and my “pretty sure” was wrong, I would have been in initiative deficit, and I might be all over the news tonight for a much different reason. While I have been able to wrap this whole thing around a saying from my upbringing, this type of incident plays out repeatedly for peace officers all over the country. It really is that close of a call time and time again. As another saying goes: It’s not the odds; it’s the stakes. The first range work consisted of some dry presentations and then quickly moved into accuracy and trigger control drills. This was followed by some diagnostic drills, and then several runs on the Rangemaster Bullseye Course. Posted below is the target from my best run, a 295 out of 300, with my other two runs being a 284 and a 288. The 284 was my first run. I had a good group, but it was clustered high in 8-ring and the 9-ring. After that, I went with a “six o’clock hold aligning the top edge of my front sight near the bottom the black, and this put the shots where I wanted them. We finished up the shooting on day one by shooting the Rangemaster Instructor Qualification Course followed by a run on the ATF qualification course. I really liked the ATF course. My first run, pictured below was a 96. The inner gray area as well as the white oval are scored at 2 points each. The outer gray area is worth one point. Anything outside of that is zero points. The high shots are from the 15 and 25 yard lines. The rest of the day was in the classroom. 96 on the ATF course. Day two started with another run on the Rangemaster Bullseye Course followed by a run on the FBI Bullseye Course. My target from the FBI Bullseye Course. After that, the pace of the shooting picked up quite a bit. We shot a drill called the 6-5-4 Drill that required the shooter to alternate between precise shots and shooting at speed. I really liked this drill and will be using it a good bit. The target had three different sized targets on it. Within a time limit, we had to put two shots on each target with only hits counting. Following that, we shot the Parrot Drill, which is similar to the 6-5-4. There were also several runs on the Casino Drill. We did a classroom session on the evolution of low light techniques (and of flashlights) followed by a range session to practice them. The final shooting portion of the class was another run on the ATF course. I managed to pull a 100 this time. The “Top Gun” award was based upon the two runs on the ATF course. We had two shooters score perfect 100s on both runs, and they split the award. The day wrapped up with some more classroom work covering target selection and design and scoring methods. This was another great course from Tom Givens and was well worth the trip. I picked up several teaching points and techniques and will be incorporating them into upcoming training. I continue to be impressed with Tom’s teaching style and class organization, specifically, each of his teaching points is well thought out, researched, and explained. There is no extraneous material. Furthermore, he provides historical context on the development of techniques. He also explains why there are things that he doesn’t teach and gives the context for that as well. It is unfortunately rather common for instructors to merely parrot things they have heard elsewhere without understanding the whys and wherefores. Tom is a legit source that not only understands what he is teaching, he knows exactly why he is teaching it.